The LSAT isn't as hard as you think it is. Really. 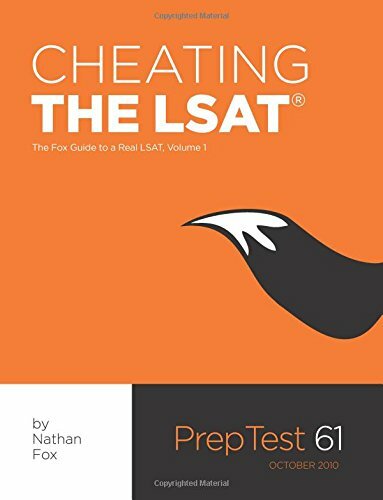 With his new book, Cheating the LSAT, Nathan Fox shows you how to make that statement a reality. In his down-to-earth, often irreverent style, he walks you through an actual LSAT, demystifying the confusing world of logic games, reading comprehension, and logical reasoning. Don’t waste time studying old or made-up questions: Nathan calmly and clearly walks you through the actual October 2010 LSAT, breaking down the methods that help you see through the BS and nail every single question on the test, with approaches that carry through when you finally sit down for the big day. By using the strategies that have garnered rave reviews from his Fox Test Prep students in San Francisco, he’ll show you how to save time on the LSAT so you can save your energy for the truly challenging questions. No nonsense. No made-up, trademarked buzzwords. No confusing jargon. And best of all, no pulled punches. Plus, you’ll also find out how you can contact Nathan personally and ask him your questions directly. So grab a pencil, pop this book open, and get it on.